A major aim of the Uzbekistan Biological Science Engagement Program is to promote participation of Uzbek scientists with the greater international scientific community. To achieve this, TMC’s Deputy Program Manager for Science (Dr. Jeein Chung) and Senior Science Coordinator (Dr. Mariam Lekveishvili) developed a capacity building program that focuses on technical knowledge such as biosafety and surveillance of infectious diseases and research related skills such as grant proposal writing. 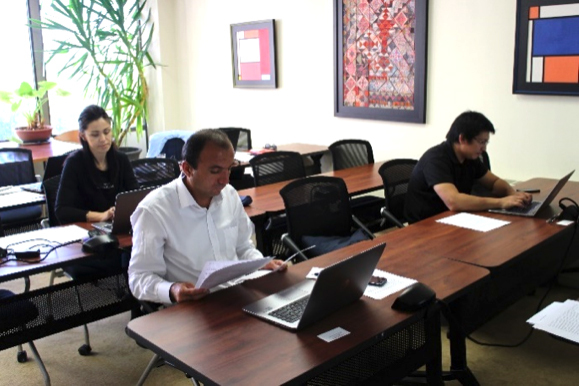 Together with the Grant Training Center in Arlington, VA, TMC initiated the Uzbeks’ first train-the- trainer workshop for Grant Proposal Writing on October 11, 2017. During this two-day workshop, three Uzbek scientists focused on strategies for grant planning and mock grant writing and reviewing exercises, ultimately gaining an appreciation for the competitive international environment of research grants and the complexity of skills required to apply for such funding opportunities. These Uzbek scientists will take their newly acquired knowledge to the relevant stakeholders in Uzbekistan. Additionally, on October 14-18, TMC facilitated the participation of four Uzbek governmental officials at the Annual Biological Safety Conference in Albuquerque, NM . This conference was attended by more than 600 biosafety specialists from around the world. As part of the conference, the TMC-hosted Uzbek officials attended the Advanced Laboratory Design Principles pre-conference course, which will supplement local ministries’ knowledge on laboratory biosafety.